In the previous two ‘Cultural Insights’, we looked the paintings of Russel Drysdale. He painted the Australian outback in a sinister and uneasy way. Now, let’s look at probably the two most famous Australian paintings of all time, which see the world differently. The first was painted by an early Australian painter named Tom Robert (9 March 1856 – 14 September 1931). In contrast to Drysdale (who came much later), Roberts saw the outback in a much more positive way. Here is his most famous painting, called ‘Shearing the Rams’, painted in 1890. 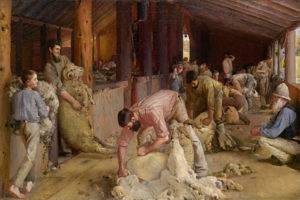 It shows real life, and celebrates ‘manly’ work, in this case, that of the wool industry, which was one of the first major industries of Australia. An interesting fact is that the ‘tar-boy’ (the smiling figure in the centre of the picture) was actually a girl. Her name was Susan Davis, and she lived until 1979.